Yet another Radi0Kit K318. The kit comes from Greece and has some good quality parts; Wima, Dale, ceramic sockets. polyprolene caps and some JJ 12AX7. I swapped the JJs out for some Psvane 12AU7 "T" series MKII. If there is any PS noise the A7s will bring it up. The Psvanes are matched and more expensive and provide a much smoother sweeter sound. The JJs can be a touch edgy. 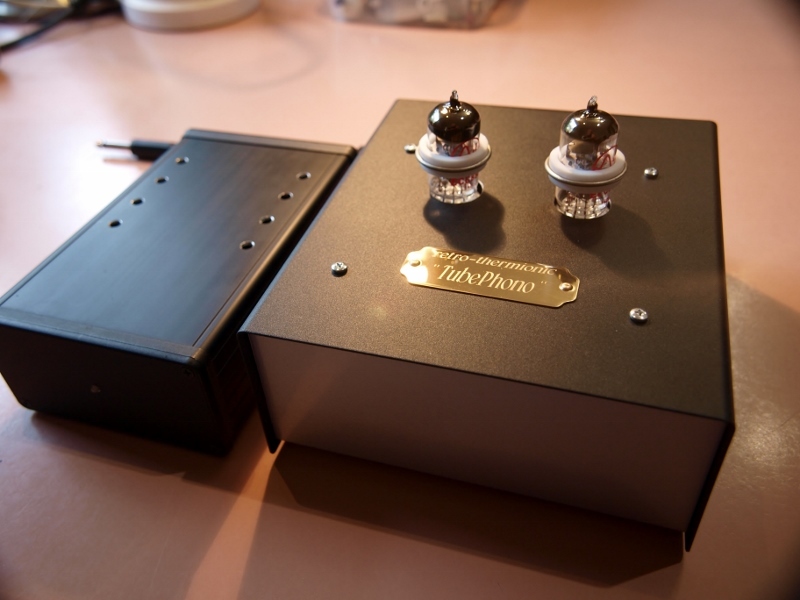 External PS from an earlier build in a Hammond extruded Al anodised enclosure. A 24V 1A wall wart provides the AC. 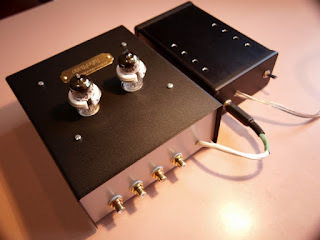 Quality gold plated RCAs and fine silver plated wire-wrap wire is used for audio internal hookup plus silver solder make this another "nice" build. The larger enclosure is a Jaycar steel and Al project box. From the AC wall wart a step down tranni is used backward to regenerate 280V for the HT. Double Pi filtering is used with nearly 400uf of filter caps. The 12V filament voltage is rectified and filtered for DC on the filaments. At the users house (on a very nice VPI TT and Denon Karat cartridge) an earlier Le Pacific MC step-up is used before the MM tube pre. The sound was "club". Smooth flowing, solid and with great image. Bass and treble sounded, once more; "club". Most enjoyable and highly believable. Forty-five years+ in electronics with a passion for audio. "najah" raw 180W Class D amp.